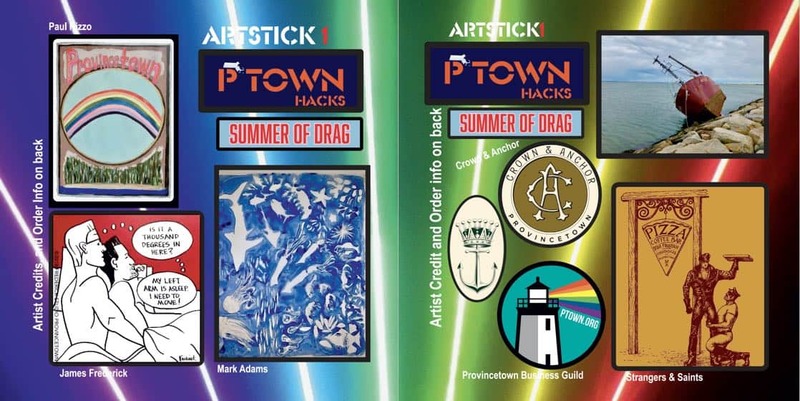 This year’s Ptown Hacks 2018, the insider’s guide to America’s top gay destination, Provincetown has something special…free Provincetown stickers. A few local artists and a few local businesses with design we admire let us create stickers with their work. The Provincetown stickers for year 1 are above and include great work from Mark Adams, Paul Rizzo, and James Frederick. Logos from the Provincetown Business Guild, Crown & Anchor, a sample of the wallpaper in the bathrooms of Strangers & Saints and an image of the now iconic/ironic shipwreck Artemis that was around all Spring. 12 stickers in all for your enjoyment. Get them free in printed copies. Print your own. Send a SASE for a free set or buy some to help cover the cost and share with friends. 3. Send us a Self Addressed Stamped envelope. Get a set of professionally printed stickers (12 stickers per set). Address and details in download of Ptown Hacks, form below.